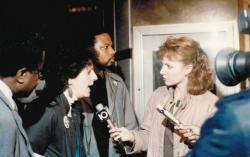 Vera Michelson, co-chair of the Capital District Coalition Against Apartheid and Racism (CD-CAAR) talking to the press at a demonstration and picket line outside a performance by Ray Charles. CD-CAAR organized the demonstration and picket against Ray Charles as part of a campaign to boycott Charles because he had performed in apartheid South Africa in violation of the cultural boycott. On Michelson's left is E.J. Josey, President of the Albany NAACP and on the right is Merton Simpson, co-chair of CD-CAAR.